The United Arab Emirates has signed an agreement to establish a second foreign military base in the Horn of Africa. The new base, according to the source present at the negotiations, will be established at the coastal city of Berbera in Somaliland and will be an air and naval base. According to the government source the MoU was signed in the last week of September when a senior Somaliland delegation was in the UAE. The self governing semi-autonomous Somaliland and the UAE enjoyed close political, economic and military ties since 2012. The cooperation between the two countries intensified after the UAE’s involvement in the Yemen operations where the region’s strategic location south of the Bab al Mandeb strait proved crucial to their projection capabilities. An area of 40km sq compromising of Berbera airport and sea front have been provided to the UAE for a period of 25 years and is renewable, the source added. The base has been provided in exchange for security training, support and protection to the autonomous region, the source added, providing a much needed security blanket to Somaliland which borders Somalia to the south. Just five kilometres away from the base UAE ports giant, Dubai Ports World, has signed earlier this year a $442 million deal to develop Berbera port. The 30 year deal will see the commercial port expanded and doubled in size next to a large free zone and other infrastructure projects to provide a new gate way to Ethiopia, Africa’s fastest growing economy. According to Alexander Mello, security analyst at New York based Horizon Client Access the UAE’s plan to operate their Eritrean Assab base simultaneously with the Berbera base is quite plausible. ‘Assab is still a pretty austere base, the work the UAE is doing there – especially the the expansion of the hangars and apron and building a new docking facility for UAE vessels 10km north of of current Assab port – is consistent with a long-term UAE presence,’ Mello said. The UAE has been putting up aircraft shelters and deployed half a squadron of Mirage 2000 fighters to the base in September, Mello added, which again is consistent with a long-term presence. ‘They might be speeding up development of Berbera now to have a base out of Houthi missile range. It’s possible Assab will be focused more on supporting ops in Yemen and Berbera will be primarily used for conducting naval and air ops in the Bab al-Mandeb and Gulf of Aden with the U.S. and Egypt,’ he said. Shehab al Makahaleh, political analyst at consultancy group Geostrategic Media, said that despite the UAE previously adopting a cautious foreign policy the recent financial chaos, the Arab Spring and Islamic militancy has forced the UAE to safeguard their national security by securing major sea ports in Africa. 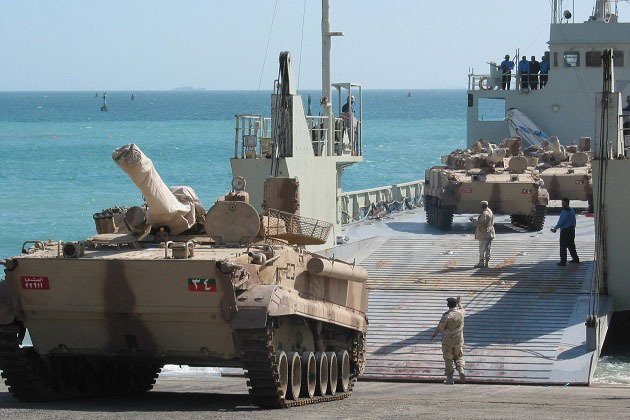 ‘The UAE is increasingly focused on projecting military power, the unrest has prompted the UAE to have its own base in the Eritrean port of Assab. In 2015, this simple port was built up from empty desert into a modern airbase, deep-water port, and military training facility,’ he said. Al Makahleh said that ‘the rapid militarization’ in the Horn of Africa by Saudi Arabia, the UAE, Qatar, Turkey, Iran, China, Russia, the UK, France – and the American presence on the west coast – under the aim to preserve the security and stability of the region has turned out to be a competition for its resources.